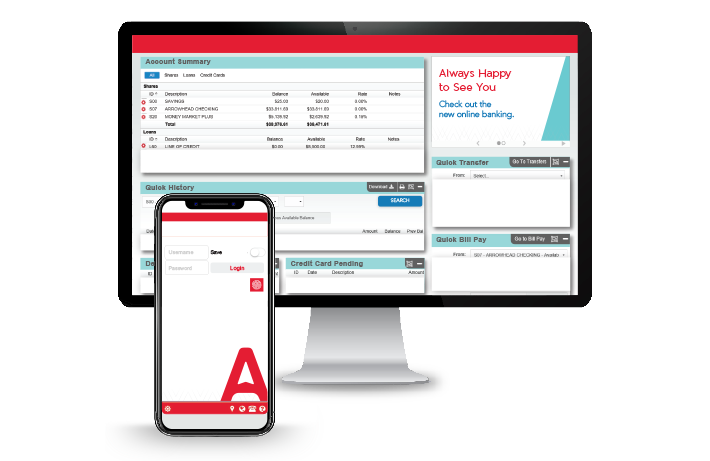 Bank anywhere, anytime with our Online Banking and Arrowhead mobile app. Update your App or download it today! Check out the new look and the easy to use app. Easily login using Touch ID on enabled devices and with Apple Face ID. Quickly view your account balances without signing into the app. The mobile app is available for Apple devices in the App StoreSM and for Android devices in Google PlayTM! Enjoy your Arrowhead Membership with the convenience of Online Banking from the comfort of your home or work! Make your life easier with features such as free Bill Pay, ACH Transfers, and account alerts you can tailor to your needs. No one likes paying bills, but it'll be easy to do from the main Online Banking page with Quick Bill Pay. Online Banking built to fit any device. We've made it easy for you to quickly find important account information. Get email alerts when you've reached savings withdrawal limits, a low account balance, or reminder of an upcoming payment. 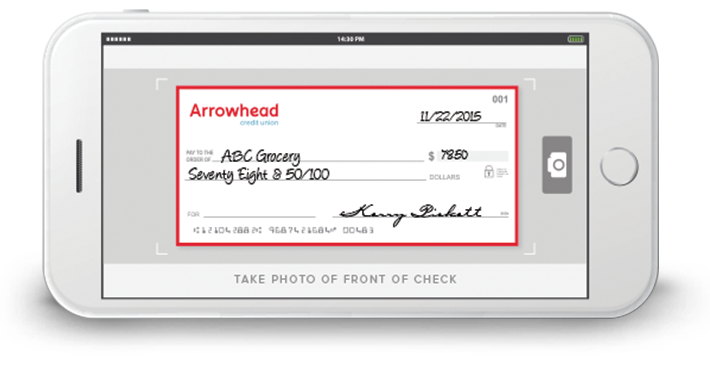 Mobile Deposit located in the Arrowhead App, giving you the ability to deposit your checks with your smartphone or tablet camera-from anywhere! Mobile Deposit is currently available for Apple and Android devices. If you don't have the app yet, you can download it below! It's simple! Just select 'Forgot Password | New User', located just above the Login Button, on the homepage and follow the prompts to be enrolled! Do I need an email address to use Online Banking? Yes, in order to receive necessary information regarding your Account, we do need an email address on file. How much is Arrowhead's Bill Pay service? Bill Pay through Arrowhead is absolutely FREE! How do I update Quicken to work with the Online Banking? Quicken has specific instructions to help you. Click Here for instructions for your computer. What Browsers are supported by the Online Banking? 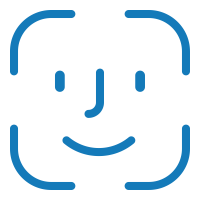 We support the most recent and two prior versions of Internet Explorer, Mozilla Firefox and Google Chrome. We also support the most recent and two prior versions of Safari for Mac users. The mobile app will be available for Apple devices in the Apple StoreSM. Android phones and tablet apps are available in Google PlayTM.